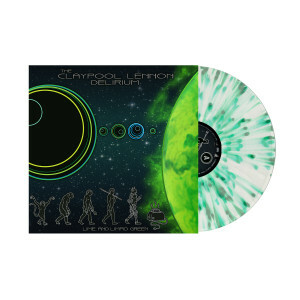 The Claypool Lennon Delirium returns with 4 cosmically trippy covers of Pink Floyd’s “Astronomy Domine”, The Who’s “Boris The Spider”, King Crimson’s “The Court of the Crimson King” and Flower Travellin’ Band’s “Satori”. Previously a Record Store Day exclusive, this wide release is limited to 3k units. Ultra clear 10” vinyl with kelly green and double mint splatter (pictured is a mockup only, final product may vary). Epic! love every song, hope they make another one.